Things close in the camera projection will obscure things further away. The Z buffer makes sure that this happens. Without the Z buffer, we would see everything that was rendered ordered by the order in which it was rendererd (which is called "the painterly method" if you're interested). This is not nice because you'd then have to sort all your polygons by z before rendering them back most first. Sometimes when things that have alpha are rendered, they render with the z buffer write turned on. This is a problem if the alpha is low (transparent) and there are more things to be rendered in the world. From this, you can see the back side of the world through the transparent arms and legs of the chair. 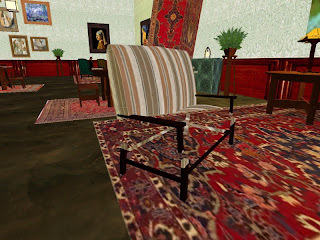 This is because the Z buffer has been written to early on in the render, and caught the destination colour (clear colour in some cases, the chair material in others where previous polygons have rendered before the glass sections) wierdly in this circumstance, it looks like the back of the chair (the bit with material) has been rendered with Z writes turned off. Using the z buffer right can get you some nice effects for free. The health bar in SnowQueen was done using a zwriting pure alpha texture, then rendering a full red bar at a slight angle and bringing it forward to show progressively more of the bar (sliding along the opposite angle to the adjustment angle), and only after that rendering the bar overlay that hid any edges.